Hybrid interfaces combining inorganic and organic materials underpin the operation of many optoelectronic and photocatalytic systems and allow for innovative approaches to photon up- and down-conversion. However, the mechanism of exchange-mediated energy transfer of spin-triplet excitons across these interfaces remains obscure, particularly when both the macroscopic donor and acceptor are composed of many separately interacting nanoscopic moieties. 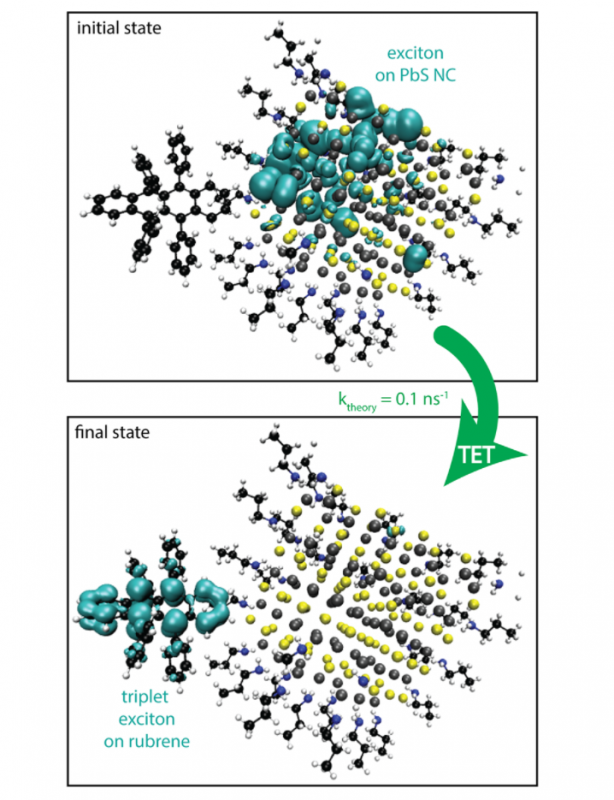 Here, we study the transfer of excitons from colloidal lead sulfide (PbS) nanocrystals to the spin-triplet state of rubrene molecules. By reducing the length of the carboxylic acid ligands on the nanocrystal surface from 18 to 4 carbon atoms, thinning the effective ligand shell from 13 to 6 Å, we are able to increase the characteristic transfer rate by an order of magnitude. However, we observe that the energy transfer rate asymptotes for shorter separation distances (≤10 Å) which we attribute to the reduced Dexter coupling brought on by the increased effective dielectric constant of these solid-state devices when the aliphatic ligands are short. This implies that the shortest ligands, which hinder long-term colloidal stability, offer little advantage for energy transfer. Indeed, we find that hexanoic acid ligands are already sufficient for near-unity transfer efficiency. Using nanocrystals with these optimal-length ligands in an improved solid-state device structure, we obtain an upconversion efficiency of (7 ± 1)% with excitation at λ = 808 nm.